Each year thousands of pedestrians fall victim to car accidents.There are many causes and reasons for those car crashes, but statistics shows that a lot of pedestrian victims haven’t used safety reflectors and that raises the question about the importance of wearing a safety reflector. Read on to see how you can make your street walking safer without much effort from your side. 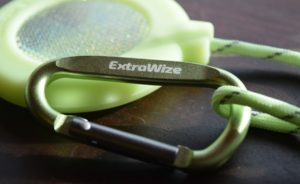 Here at ExtraWize we have made a list of 5 bad excuses for not wearing a safety reflector and what can you do to avoid making these excuses. I can see cars and make sure that I cross the street safely. That’s awesome, but your attention can catch a text message on your smartphone or shiny advertising in some shop display window and you can miss a car. Unfortunately (or fortunately – it is a matter of opinion) people don’t have headlights like cars and the pedestrian’s equivalent for car lights is the safety reflector. Safety reflectors make you visible regardless of your desire to answer that text message or Facebook chat. The area where I usually walk is well lit so why do I need extra safety measures? This is a sticking point that always comes up when discussing an importance of safety reflectors. Pedestrians should know that for drivers they are visible only when they are directly under the street light and even then the distance from which drivers can notice a pedestrian that doesn’t wear a safety reflector is very short. I don’t know where I can buy a safety reflector. We can offer the easiest solution to this problem. Just visit the ExtraWize online shop and order a brand new GloDisk for you and your close ones. You can also check your local sport stores, book stores and supermarkets for regular safety tags. The cord tangles with keys or gets in the way in public transport and the pin attachment damages clothing. GloDisk’s well-thought-out design doesn’t have any thin cords that could easily break or pins that can damage your jacket or coat. Instead you can attach it with secure carabiner clip to your rucksack, bag or even jacket. Certainly there are other options for those who want a safety reflector without a cord. For example you can purchase a slap wrap or reflective stickers for clothing. I am a grown up I can look after myself, but I’ve made sure that my kids are wearing safety reflector. It is good that parents or grandparents ensure their kids safety on the road. But just think about the example they set by not wearing a safety reflector themselves? How kids should understand the vital importance of wearing a safety reflector if their own parents don’t wear it? So set a good example for your kids as well as making yourself safer on the road by wearing a safety reflector! As you can see all excuses are easily solvable.